In a remote Pennsylvania hunting lodge, miles away from any guitar-making workshop, Ted McCarty, who had been recently elected as the president of Gibson, stomps the snow off his shoes on the front steps of the building. The stakes are high and he doesn't want to look out of place. For the past year, he and his team have been hard at work trying to try to catch up with Fender and its electric success, spearheaded at that time by the Broadcaster. They have been working on the company's first solidbody guitar for months. Stomping his feet at the same time, his assistant holds on tightly to the prototype. The door opens and they walk into a living room converted into a recording studio by two of the biggest stars of the day: Les Paul and his wife Mary Ford. Ted is there to try to win over Les, the great guitar player, with the new guitar model Gibson intends to market. Nobody in the room has the slightest clue that the instrument in question will sport his name for all eternity. Lester William Polsfuss was born in Waukesha, Wisconsin, in 1915. At 17, he was already an accomplished guitar player who went by the name of Rhubarb Red, making a name for himself in radio as a country artist. He would soon move on to rhythm and blues and jazz, changing styles depending on the contracts he landed. In parallel to his budding career, and like many of his contemporaries in the 1930s, Lester became really passionate about his instrument. This allowed him to catch a glimpse of the electric revolution coming. Following the steps of Paul Tutmarc and George Beauchamp, Lester engaged in different experiments, first with a gramophone pickup and then with a telephone one. He was tireless and a fast learner. But he was far from having the resources of Rickenbacker and his Spanish Bakelite guitars or Gibson and his ES150, introduced in 1936 — two concepts of acoustic guitars with amplification introduced in the '30s. After realizing that making a living from his idea was not realistic at this point, he decided to pursue a musical career under the name Les Paul. 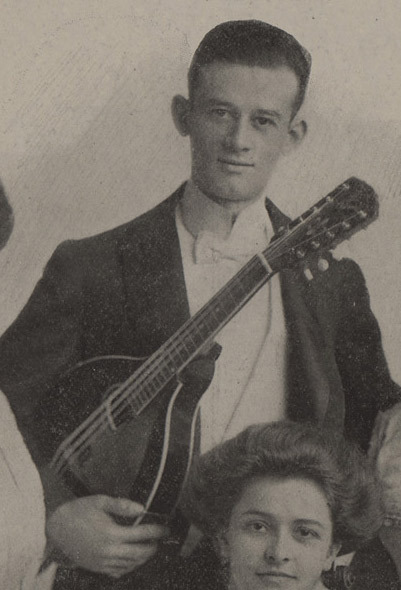 Soon after, he changed his Gibson L5 for an Epiphone and, at the same time, became a frequent visitor to the workshop of the Greek guitar maker who had emigrated to New York in 1910. He started to make use of the facilities of the company during weekends and staff holidays. And that's when he started to swap his musician hat for a Dr. Frankenstein one: He cut into a board and added two pickups he had developed, a basic electronic circuit and even a tremolo bar. He then attached the neck to it in the most rudimentary way (using metal hooks!) and came up with the brilliant idea of cutting a guitar body in two parts to place them on both sides of the board. That way, his guitar could still have the aspect and design of a Spanish guitar. One day, old Epi (Epaminondas Stathopoulos, the creator of the Epiphone brand) arrived at his workshop only to see this fantastic creation standing there. 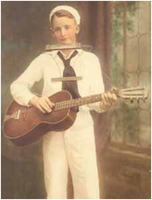 Les Paul introduced him to the solid-body guitar concept, which he proudly called The Log. And it was then and there that Les Paul realized that the concept of a solid-body guitar was truly appealing. Both for the manufacturer and the musician, since it was easier to make than an archtop and it could reproduce the sound of the strings without any feedback or any other issues related to an amplified sound box. He then modified two other standard Epiphones by cutting up the body to fortify it before adding the pickups. He would take these three guitars everywhere with him. 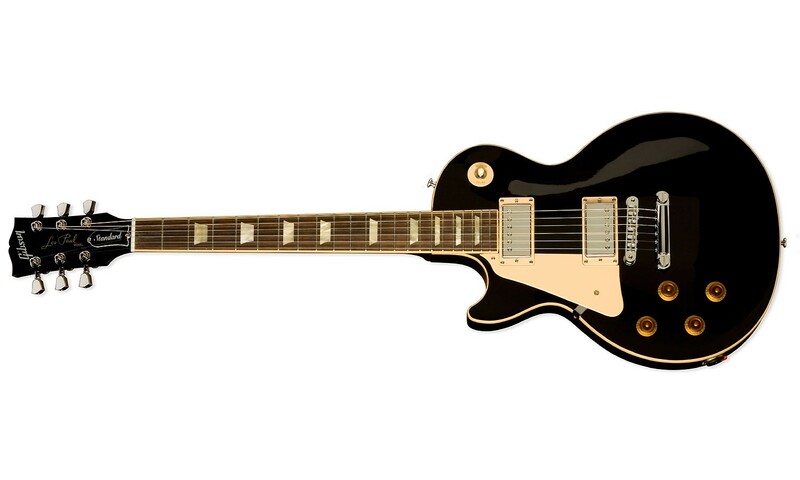 And despite their performance on stage and in the studio, they were rejected by all manufacturers, all of whom shut their doors to Les Paul and his invention for over a decade. 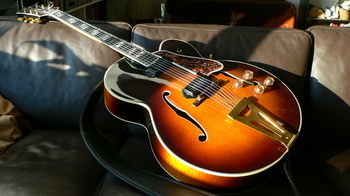 Gibson included: Maurice H. Berlin, the manager of the company just couldn't see any commercial potential for the Log. This was four years before the first electrical Fender came out! 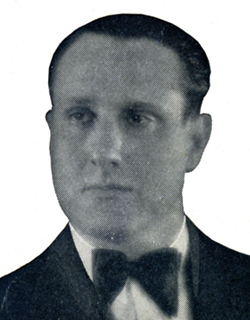 Despite the incomprehension of the industry, Lester would continue his musical career and become a pioneer of sampled music and multitrack recording. Being the innovator he was, he had more than one card up the sleeve. He decided to put aside the marketing of his invention and took to the studios. He played, among others, with Nat King Cole, and Bing Crosby, who hired him as sound engineer for his LA studio and would also fund Lester's experiments later on. For instance, the advancement of sound recording technology. At the time, recording was limited to capturing the entire band with ambient mics. The limitations of this method were obvious, until Lester decided to turn everything upside down. In 1942 he started manufacturing his own tape recorder, put together with pieces from an airplane and a hubcap. He would use this makeshift invention to record some of his greatest hits. From 1945 to 1950, Lester shut himself away in his studio to perfect the technology that would become his sound signature: The "new sound of Les Paul." To achieve it, he used two multi-track tape recorders to record himself on the fly, take after take, in order to create different guitar or vocal layers on a single tape. He then came up with the idea of tampering with an Ampex recorder acquired by Bing Crosby and added a playback head before the eraser head. The idea was quite simple, but brilliant: You just had to record a part first and then rewind the tape. Thus, every time you recorded, the playback head played back whatever was going to be erased from the tape and added to it another take being played on the fly. And everything was recorded onto the same or another tape. This way, Les Paul was able to record up to 12 guitars, while at the same time playing with the tape speed, to create previously unheard-of effects. But that wasn't enough for someone of his genius. He would also set the foundations for a technology that would become a common procedure in the studio. Because, while his first system was great in good hands, it had a major defect: Since the original recording was erased with every pass, if the player made a mistake on the last take, he would have start over from the beginning. So Lester decided to use another Ampex recorder equipped with a 1" tape separated into 8 independent sections. 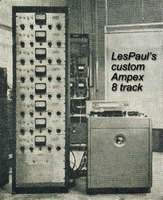 Each of these eight sections had its own recording and playback head, added by Lester and his team. The new system, called The Octopus, allowed you to record and erase any track at will. 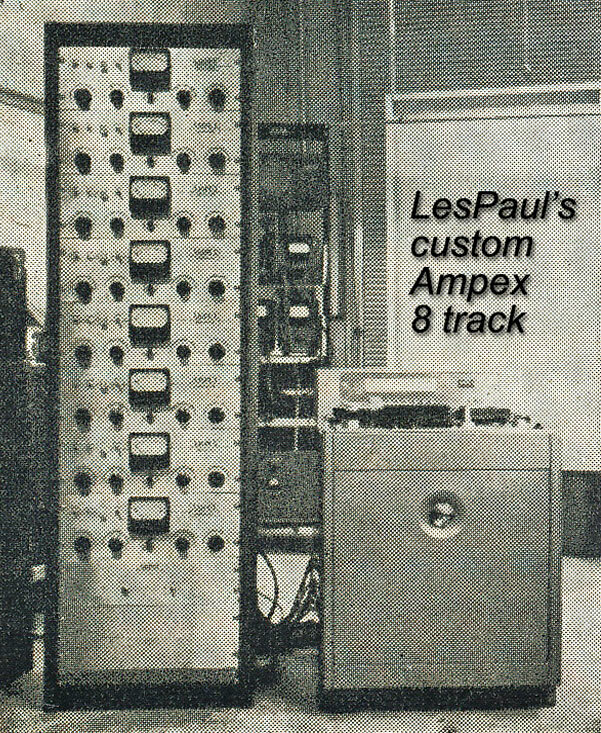 That's right folks, Les Paul was the inventor of eight-track recording! In 1948, a near-fatal car accident would immobilize him for two years. In 1949 he would marry, both before God and on stage, for the second time with one Colleen Summers, also known as Mary Ford. Together, they would take the stage by storm and become a great success. During their career, they would have many hits, including two number-ones, and even a TV show called "Les Paul and Mary Ford at Home." 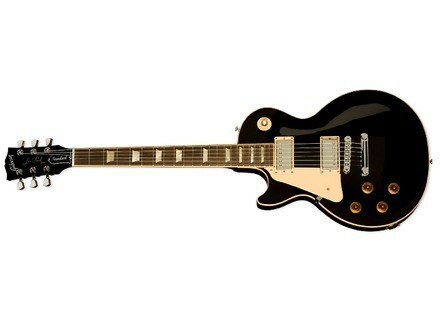 Les Paul was thus able to bring his "new sound" to a dumbstruck audience, using machines onstage to replace an entire orchestra. The couple would enjoy fame and fortune, earning up to a million dollars in a single year. Hence the interest of the big shots at Gibson, especially of their new visionary leader. In 1948, Gibson brought new blood into the company in the person of Ted McCarty (pictured at right), whose importance can't be underestimated. He is the man behind the Les Paul guitar. 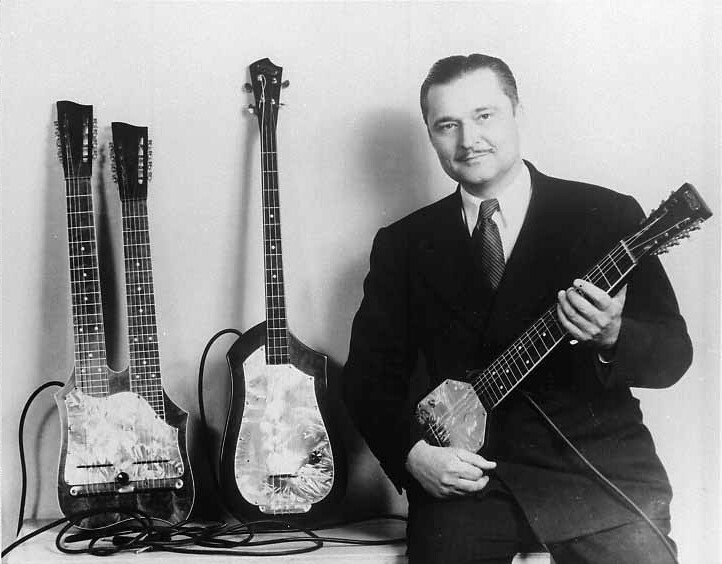 In 1950, Maurice H. Berlin ─ the boss at Gibson's parent company ─ made Ted McCarty president of Gibson and entrusted him with the task of perking up the Gibson catalog. The guitar market was exploding and, even if Gibson still benefited from many of the ideas of Lloyd Loar, which basically defined how a guitar of the brand ought to be like, the company was still too specialized in manufacturing folk instruments, like mandolins. Gibson had already introduced the concept of the arched top and invented the truss rod, but that wasn't enough to drive sales back then. And it was the competition that really stepped on the gas pedal. In 1950, a small California-based amp dealer decided to market the Broadcaster: A solid-body guitar that was especially appealing to country guitarists and experienced an increasing success. Meantime, at Gibson, electric models were still amplified acoustic guitars that weren't appealing to anybody. Ted McCarty felt the change of winds and realized that Gibson needed to jump on the train and start manufacturing a solid-body instrument. They soon started developing what would become the Les Paul guitar. The guitar featured a mahogany body on top of which was glued an arched maple board. It inherited a lot of elements of previous models: The P90 single-coil pickups and knobs (V,V,T,T) were taken directly from the L5CES and the Super 400CES (pictured at left). The shape of the body followed an old tradition of the brand, as did the mahogany set-in neck. The trapezoidal inlays it featured had already been used on an ES 150 model from 1950. After one year of work, the project was nearly finished: The first Gibson solid-body guitar had already the shape, the timbre and the resonance of what would later become an industry standard. It just had to be marketed. And McCarty couldn't think of anyone better to do it. Lester takes a look at Mary, his partner onstage and in life. In his hands is the prototype of what would become a legend among electric guitars. "What do you think, Mary, should we get involved with them?" All business decisions were taken by the two of them. And even when it came to Lester's guitar, Mary had the final word. As history can attest, the answer was positive. The contract was written right there, in their own living room.